We made it to the Stone Mountain Park Campground just after their registration office closed yesterday evening. They have an after-hours checkin, so we proceeded to our reserved RV space and found it to be a bit small for our rig. Lesson 1: When reserving a campsite, be sure to include the added length of the tow vehicle when asked the size of the RV. We chose another site knowing we ran the risk of picking a spot that, although available for one night, may not be available the entire week. Turns out that indeed we selected a site that was reserved starting today. So, we had to move. We had set up all the outdoor gear (rugs, camp chairs, kids bikes, etc.) which meant we had a bit of take down and set up to do. All told, it probably took us about an hour or so to select a new site and relocate to it. Not too terrible, but mildly annoying. Lesson 2: When arriving late evening on a site that has not been reserved in a reservation only campground, don't unpack the the kitchen sink (literally & figuratively - we have a campsink) until availability is confirmed. I had originally reserved a lakeside site which means right on the water and our second choice was also lakeside. By the time we were aware we needed to move however, all the lakeside sites were taken - rather there were no lakeside sites available for the period of time we intended to stay. Nevertheless, we are pretty happy with our final selection. The Stone Mountain Park Campground has numorous and wide varieties of campsites from primative tent sites to RV sites with water, electric, sewer and cable hookups. Amenties include laundry and shower facilities in every loop, a pool (which doesn't open until April), playground, sand volleyball, boat rentals, wifi, a central indoor pavillion and more. Beach access for the lake is right next door and boat rentals are available at the general store. So far we are fairly impressed - no doubt this place is packed in the summer months. Hello Shanna. My name is Thad Weed. I own Valet RV Rental in Loganville, GA. Valet RV Rental is unique in that I tow and setup a 2013 travel trailer furnished with everything you need to camp. The campers have plenty of room to sleep up to 6 adults and 2 children. All your group has to do is drive to the campground, pull up to the camper and enjoy! When your rental period is over, I return to pick up the camper. Currently I'm delivering campers to Stone Mountain Park Campground, Fort Yargo State Park campground in Winder, GA and GA International Horse Park. For more details about Valet RV Rental services, pictures of campers and rates please visit my web page at www.valetrvrental.com or view my attached flyer. 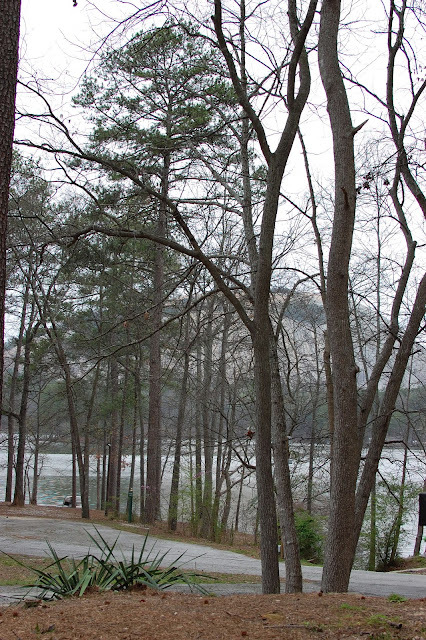 Camping reservations are made through Stone Mountain Park Campground and are based on availability. Thank you for your time, consideration and forwarding this information to people you believe would Enjoy A Valet Style Camping Experience.